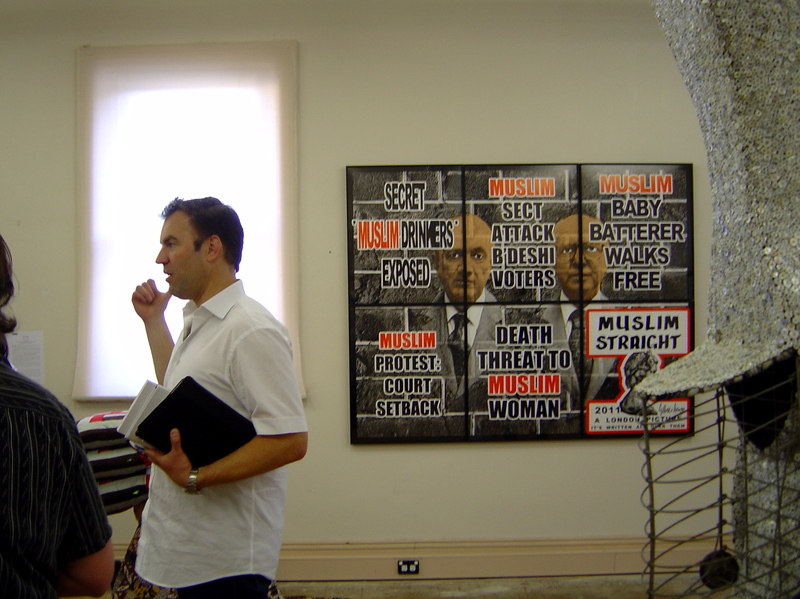 On the first really hot Tuesday of this spring I arrived to see Berlin gallery owner, Matthias Arndt for a tour of Migration, his first Melbourne pop-up exhibition at Ormond Hall in South Melbourne. I was waiting for him in this amazing ballroom with a few other people. From the outside Ormond Hall looks like a modest gothic revival building. It was built for the RVIB (Royal Victorian Institute for the Blind) in 1891 but on the inside it was remodelled in 1922 in the art deco style when a new dance floor was installed. It has seen performances from Dame Nellie Melba, AC/DC and Skyhooks. This is the way that I want to be treated for an exhibition opening; a glass of good champagne on arrival, a media pack and then a tour around the exhibition before the general public arrived. It is good to be introduced and to have the opportunity to talk with people involved in the exhibition. This was not just another exhibition invite in the email box where I have to introduce myself and identify the exhibiting artist. (I hope some people are taking notes.) Gabrielle Wilson, of [art]iculate, the publicist for the exhibition has done a great job promoting the exhibition and after the second glass of champagne I honestly wanted to tell people to see this exhibition. I was a bit concerned before seeing it that this would be yet another slick commercial gallery with a lot of prints and other multiple editions from some big name artists. But the list of artists intrigued me, as did the mention of ”the Berlin style of staging exhibitions in abandoned and unexpected spaces.” The art on exhibition is serious and impressive – not just the names. In the end I wasn’t so impressed with the Berlin style of staging as it was like is seeing another artist-run-space. The art was exhibited in the stripped-out former offices and classrooms on the upper floors of Ormond Hall. They still have their fluoro lighting and ceiling fans but anything is better than another white cube. Matthias Arndt was honest about the reasons for his own migration to Australia; there are personal, professional and strategic reasons. In the week that the Australian Government released their Asian strategy white paper Arndt has made this own strategic move for the Asian art market. His Australian wife and 4-year-old son were the personal reason. He has already had a pop-up exhibition in a building in the Rocks in Sydney and now he is announcing his presence in Melbourne. I asked Arndt if this was basically high-end art for institutions and other serious collectors. “No” he replied, padlocking the built-in cupboards that had been converted into display cases with the addition of a few glass panes, “there is work from $50 and up.” Indeed there was art jewellery and DGTMB, a street artist’s limited edition t-shirts, trucker caps and bags. 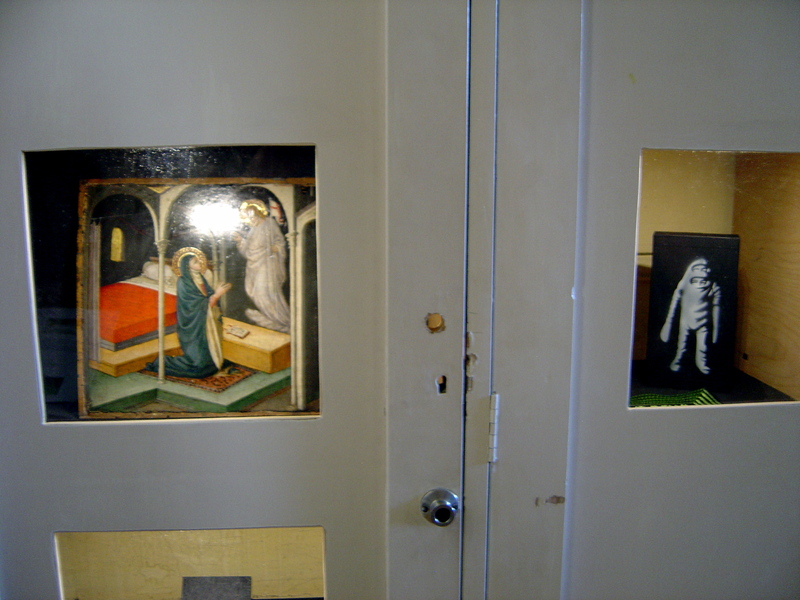 Along with the jewellery there was a small Renaissance altarpiece and a smaller painter by Joe Coleman in the cupboard. In another room there is modern furniture. I would recommend a visit before the 15th of December at least to see the world famous artists, like Gilbert and George, Georg Baselitz (“can’t avoid certain German artists” Arndt remarks), Joseph Beuys. Martin Kippenberger, Eko Nugroho and Sophie Calle surrounded by walls of peeling paint and to see Ormond hall’s art deco ballroom. This entry was posted on Tuesday, October 30th, 2012 at 11:37 PM	and tagged with Georg Baselitz, Gilbert and George, Matthias Arndt, Ormond Hall, publicity, South Melbourne and posted in Art Galleries & Exhibitions. You can follow any responses to this entry through the RSS 2.0 feed.